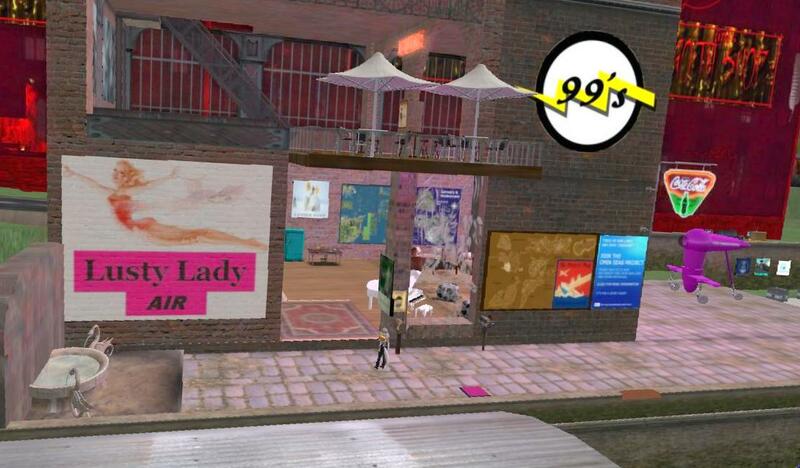 While exploring SL9B recently, I found the SL Ninety-nines exhibit, located at Hoedown (217, 230, 21). The exhibit featured photographs of Amelia Earhart and a couple of awesome planes. No pilots were there at the time, but I pocketed a LM to their site, New Amelia’s Airfield, located at Allalinhorn (42, 71, 50). Later I took a trip to their airfield, got an intro flight with Fortnight Baxton, and ended up joining the group. As many of you know, the real-life 99’s is an organization that was founded by Amelia Earhart in the early days of aviation. Its goal is to support and promote flying for women pilots. The SL 99’s was founded by Judy Dressler, a SL woman pilot and the creative owner of Clear Skies Aviation. In the photo she is standing beside her CSA Dolphin II, the trainer gear version. 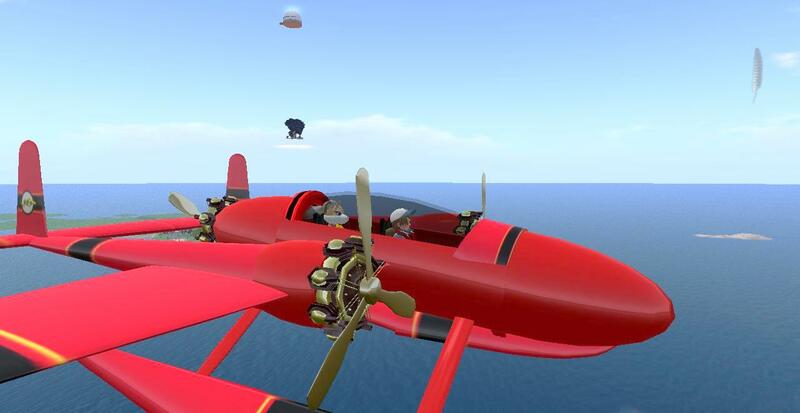 The group is non-profit, with the goal of recreating the early years of women in aviation as well as advancing SL aviation. There is also a blog for the group at http://sl-ninetynines.net. 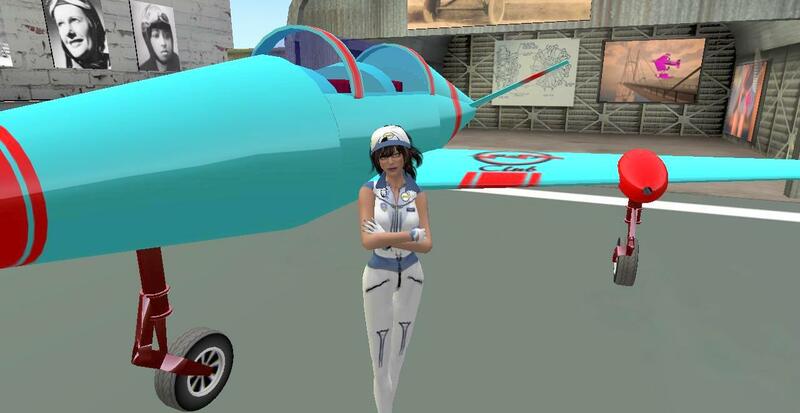 When I first arrived at New Amelia’s Airfield, SL 99’s pilot Fortnight Baxton was getting ready to fly her seaplane. Fortnight flies regularly and also builds planes. She offered me a ride in her SL99 Tereschkova Seaplane, and I quickly accepted. One of the perks of membership, she told me, is a gift of a couple of planes to help new members start flying right away. We taxied to the lift elevator that connects to the runway located at the New Horizons Airport. Along the way, Fortnight gave me a Mark 1 Arline Inflatable Personal Flotation Device to wear. Since we were going to be flying in a seaplane, we needed to be prepared for any emergency. After a quick run-up to check the engines, we were cleared for take-off. Fortnight flew us to a marina owned by one of her friends and fellow 99er. There, she expertly landed the plane in the marina and water-taxied us to the dock. After a few minutes we took off again, flying over palm trees and picturesque islands. We flew to the airport at Honah Lee Surf, located at Honah Lee Surf (185, 86, 23). I took a few pictures along the way, and was greatly enjoying the tour when suddenly flames shot out of her Number 3 Engine! I snapped quick pix of it while Fortnight took immediate action. Luckily I didn’t have to use the PFD she had given me, and we landed safely. The airport at Honah Lee Surf was active with both military and civilian planes. Fortnight, who specializes in seaplanes, also flies an F-22. She brings that one out she said “when I'm feeling the urge to go fast”. After the flight, I teleported back to New Amelia’s Airfield to get a better look at the planes and the facilities. The hangars are spacious and decorated with photographs of RL women pilots. Most of the photos are of Amelia Earhart, but Bessie Coleman, Harriet Quimby, and others are also honored. I later talked with Judy Dressler, whose nickname is Purple. She incorporates a bit of history will all of her planes. “It all began with me making the Harriet plane”, Dressler said, which she named in honor of Harriet Quimby, “Not many know she was the model for Amelia when she was a child,” she said. She also includes non-U.S. aviatrix. She named the Nancy Bird biplane after a famous Australian woman pilot, Nancy Bird Walton. Upstairs they have a club built by 99s Events Manager, Brandi Whittenton. I had a drink at the bar while enjoying the aviation photos that lined the walls. In addition to socializing, the group flies powerpuff races and supports RFL. They try to fly as a group at least once a week. Scheduling and time zones are a challenge as the group is comprised of international members. Membership is open to all SL women who support the aviation goals of the 99s. There is a one-time fee of $200L that helps support New Amelia’s Airfield. 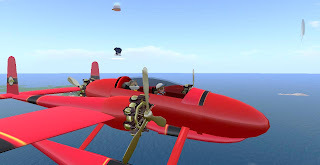 Sales from Clear Skies Aviation, Dressler’s company, helps fund the SL 99s, too. CSA is located near the hangar, with both planes and flying clothes for sale. Demos of planes can be rezzed above the shop, too, on a carrier runway. After I joined, I met up with instructor Emillie “Emily” Placebo. She went over a lot of the basics of SL flying and gave me a lot of helpful tips and aids. Afterward I went off to practice. Emily and Fortnight Baxton both made flying looks so easy. I have a lot of practicing to do, but I’m looking forward to it.